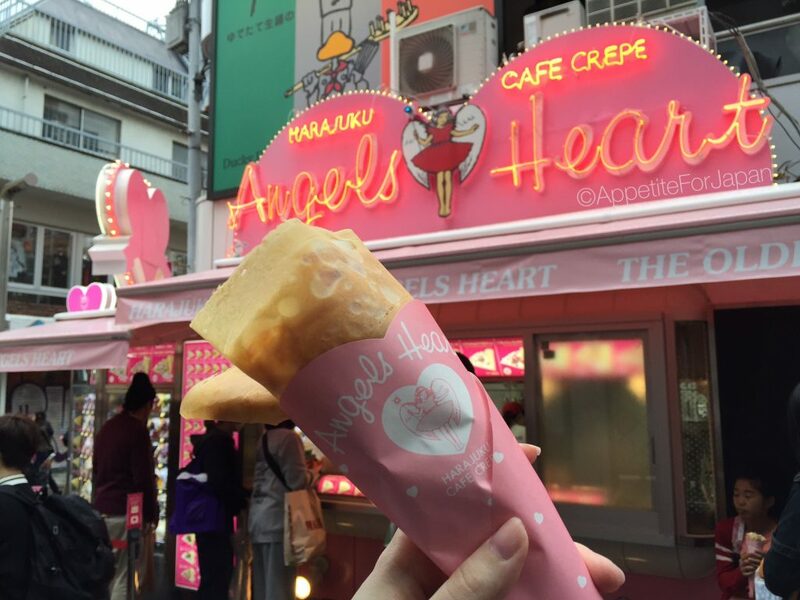 The three best known crepe shops in Harajuku are Angel’s Heart, Marion Crepes, and Santa Monica Crepes. In what I’m calling “the great crepe-off”, my partner and I ate a crepe from each of these places in one day to compare and discover the very best of Harajuku’s crepes. 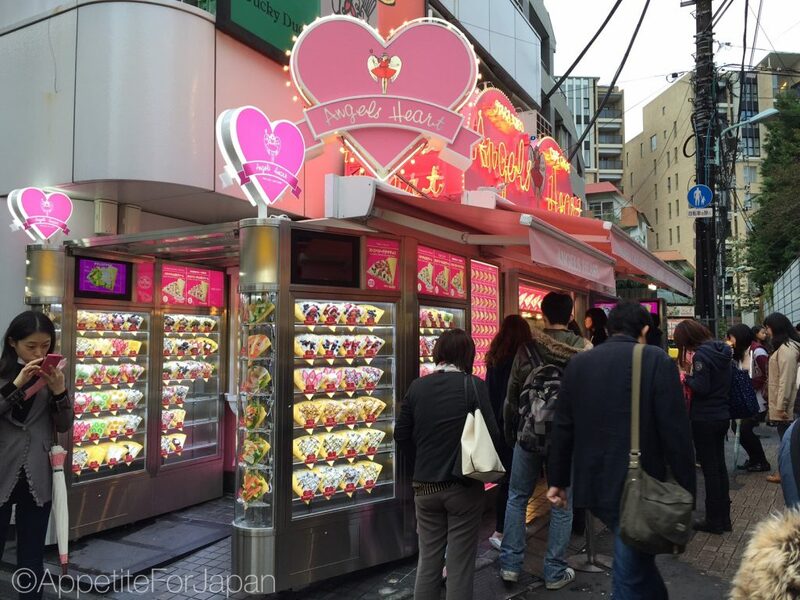 I’m going to list the stores by the order in which you’d encounter them walking down Takeshita Dori from Harajuku Station. As for which place I think is the best… I will give my verdict at the end. Without further ado, let the great crepe-off begin! Angel’s heart claims to be “the oldest crepe shop”, having opened in 1977 (one year after Marion Crepes next door). Either way, at close to 40 years old, this is one long-lasting crepe shop, and I think it would be fair to assume that they know a thing or two about making good crepes. 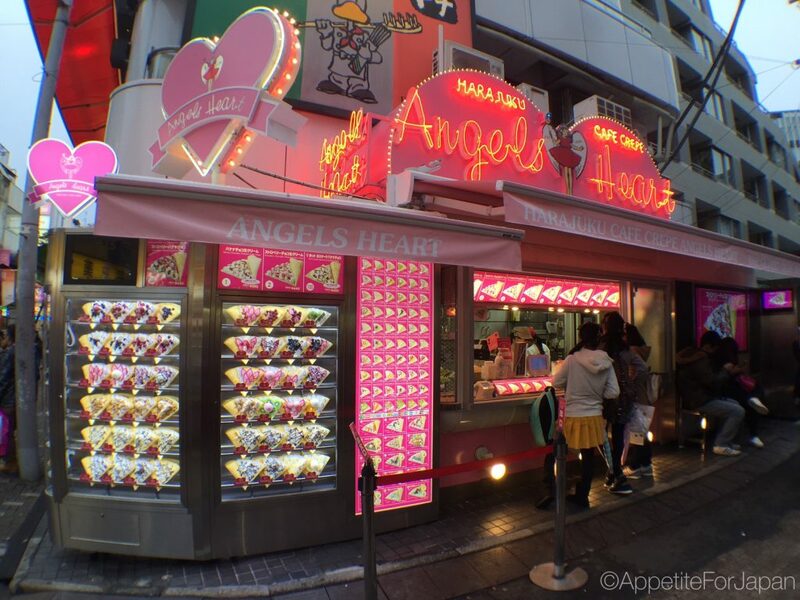 With its bright pink design and plenty of lights, Angel’s Heart is hard to miss, and it has that super kawaii Harajuku look about it. 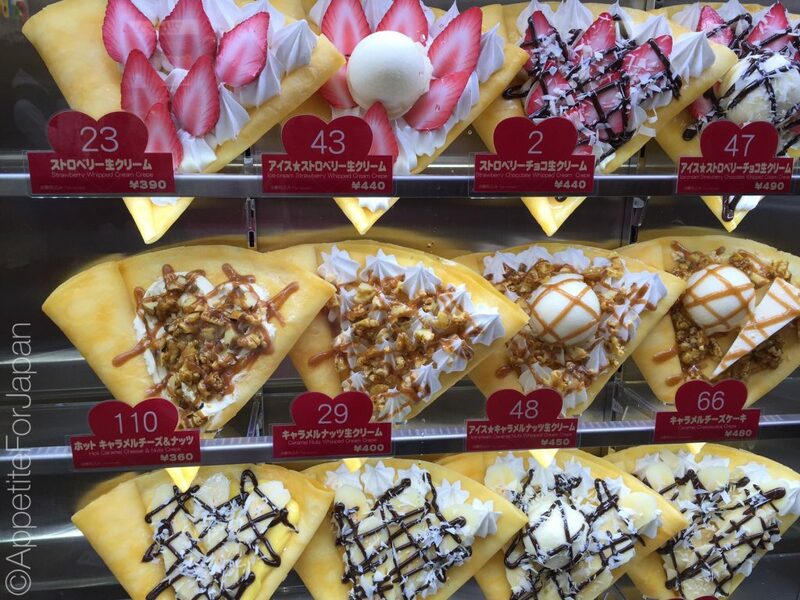 Like many crepe places, displays of fake crepes show what the crepes look like (before they finish rolling them up to serve). 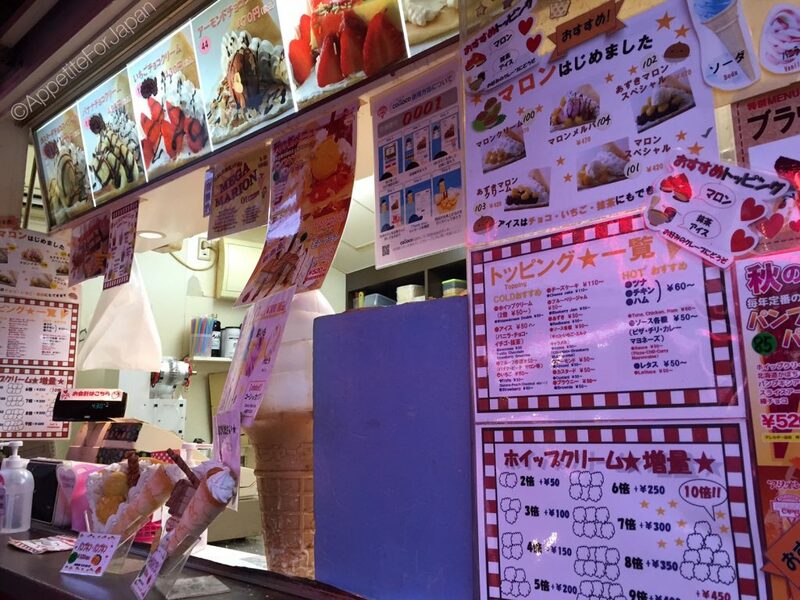 We ordered #119, the hot caramel cheese & nuts crepe – 360 Yen. Above: There it is! While I prefer a crepe with a good amount of filling, this one was certainly nice and easy to eat neatly, and it lived up to its title of being a hot crepe (all crepes should have warm pastry, but this is not always the case – at Angel’s Heart, it was still nice and hot when they gave it to us). 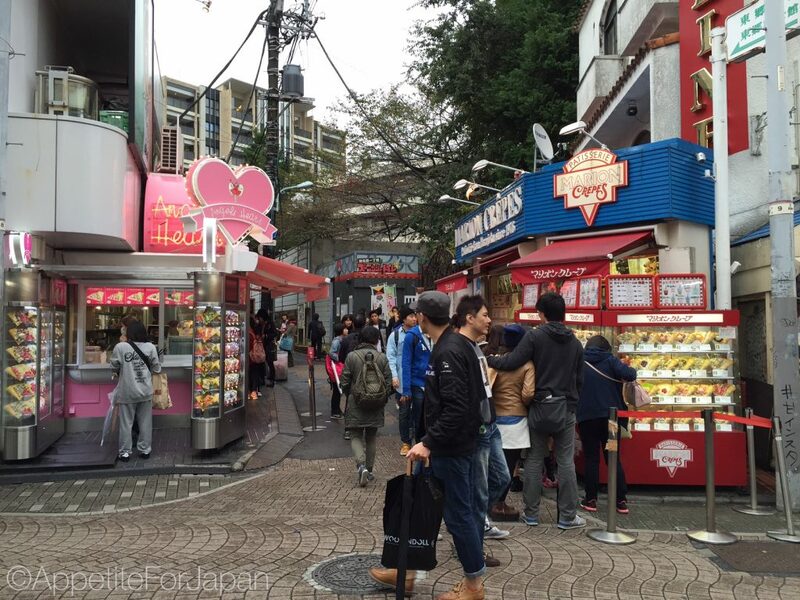 Interestingly, Angel’s Heart and Marion Crepes are directly opposite each other on the left of Takeshita Dori. 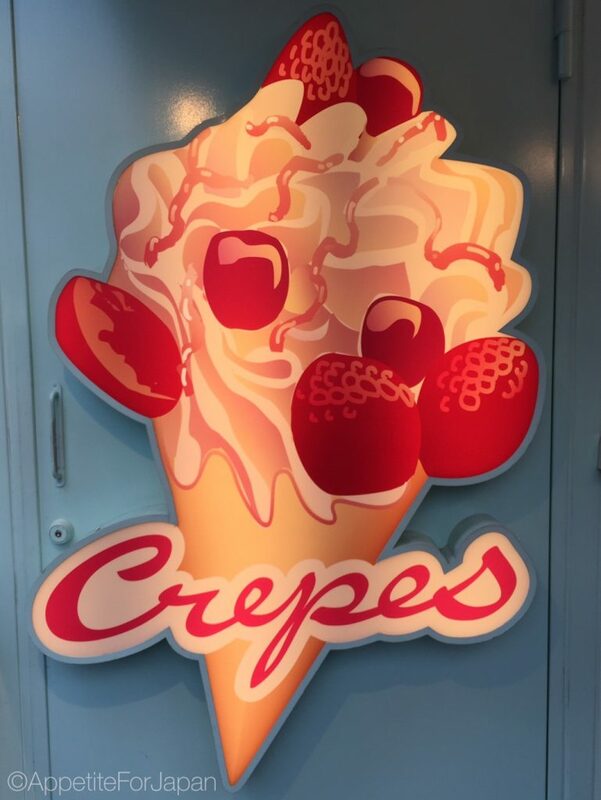 This doesn’t seem to be a problem, as they’ve both been around since the 1970s and business is still thriving – both for these two shops, and for all of the other crepe places in the area. 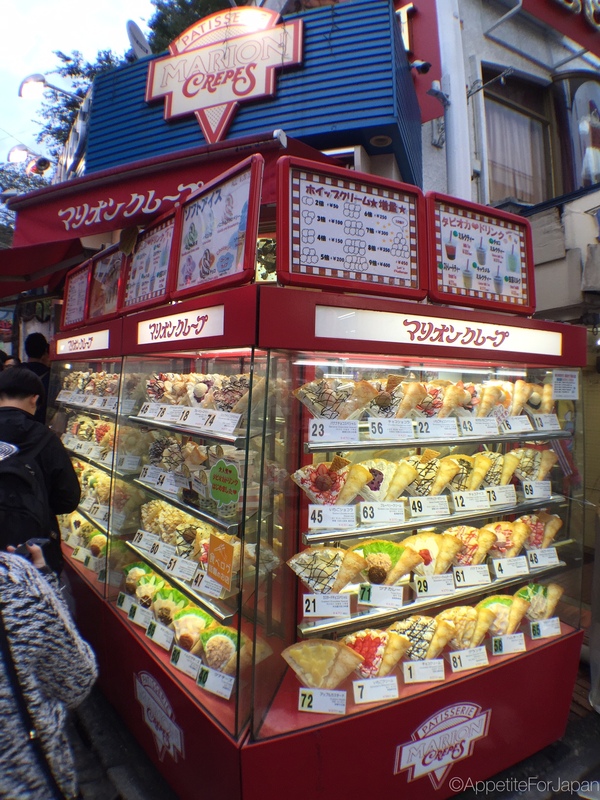 There are often long queues at both shops. 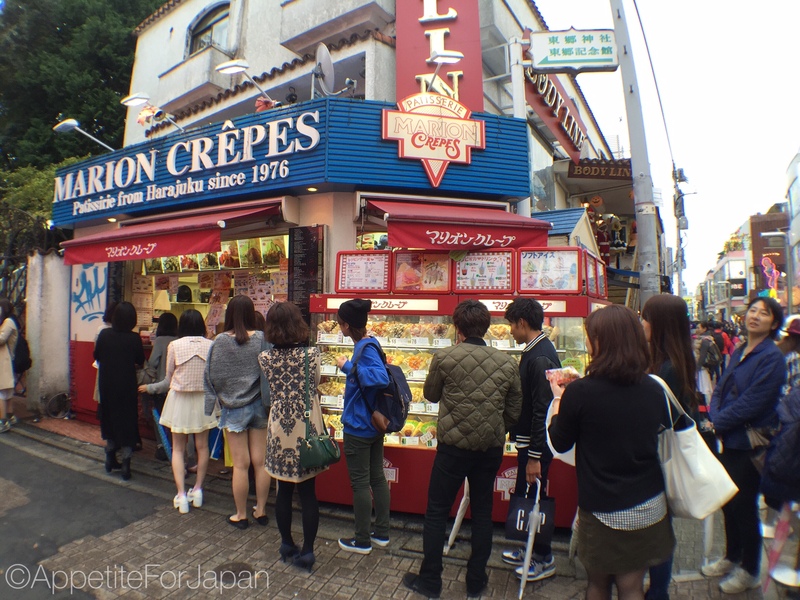 Marion Crepes is Harajuku’s other oldest crepe shop, having opened in 1976. 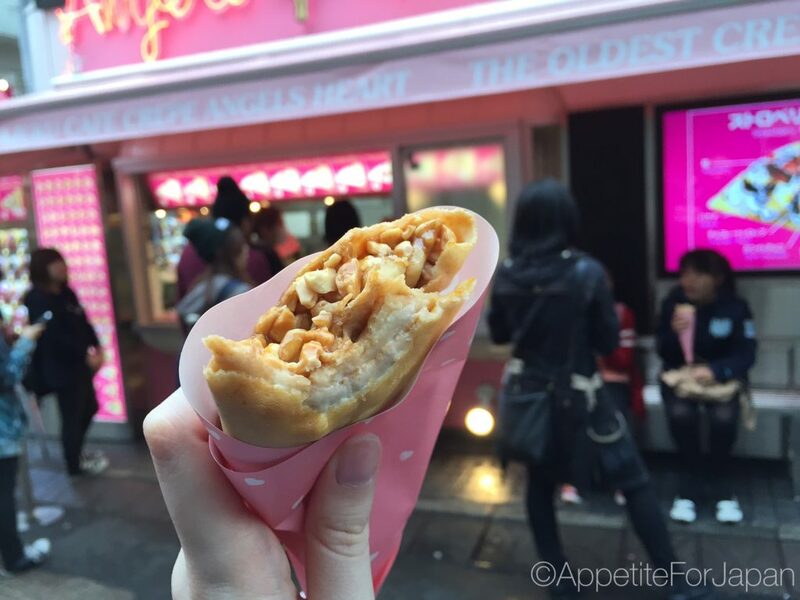 Where Angel’s Heart claims to be the oldest crepe shop, Marion Crepes – which opened a year earlier – claim to be the pioneers of the Japanese crepe. 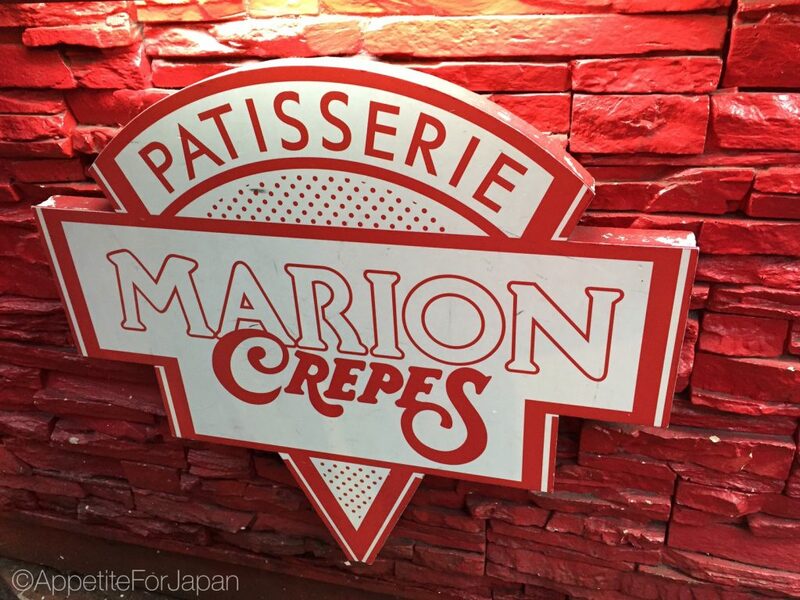 This year marks Marion Crepe’s 40th anniversary. 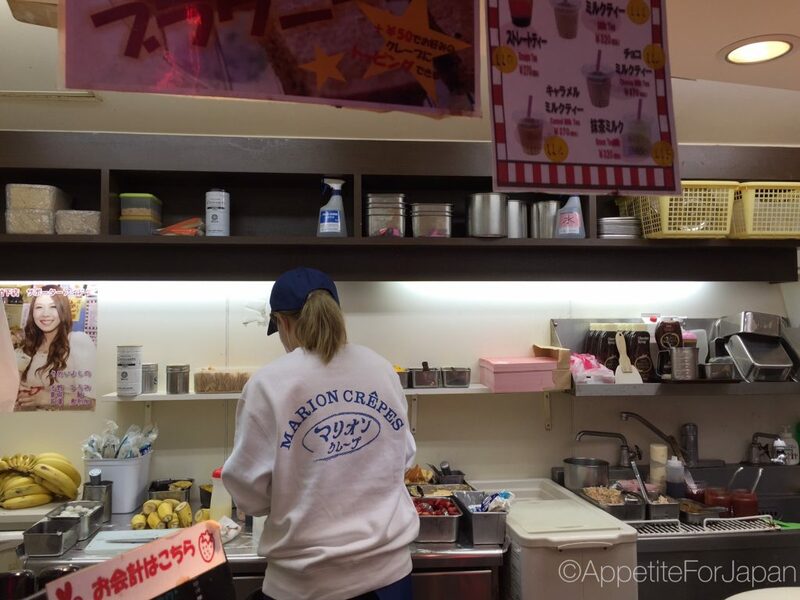 The Marion Crepes shop doesn’t have the same flashy, kawaii look that Angel’s Heart has. However, this doesn’t seem to affect their popularity in any way. The day we visited, they had the longest queues. You’ll find the fake food versions of Marion Crepes on display as you line up. 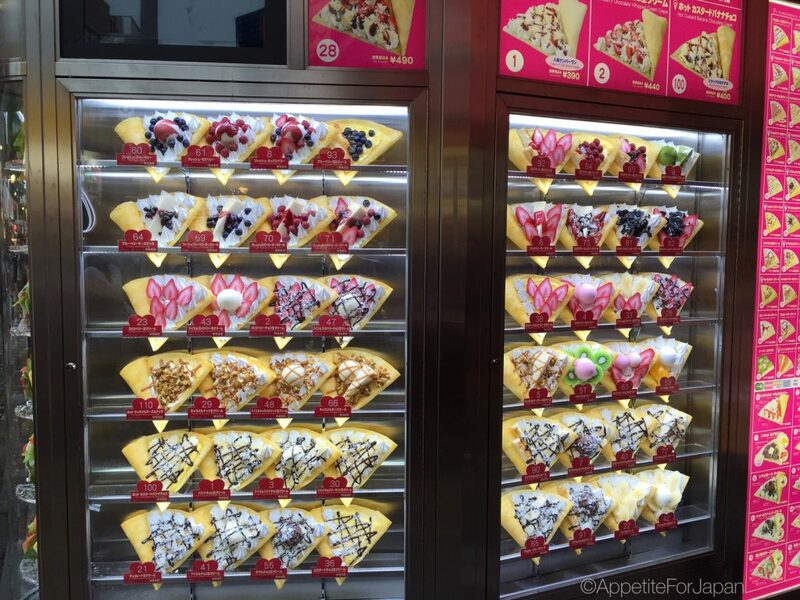 Above: As you get closer to the counter, you’ll see displays of their new, special crepes. Above is the ‘Mega Marion’. 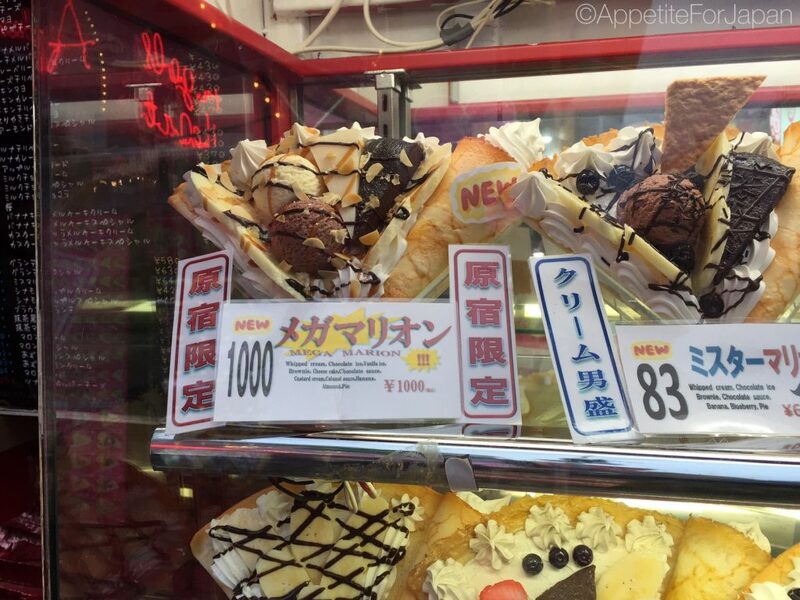 At 1,000 Yen, it’s about double the price of a normal crepe, but it has more than double the fillings – whipped cream, chocolate ice-cream, vanilla ice-cream, chocolate brownie, a slice of cheese-cake, chocolate sauce, custard cream, caramel sauce, banana and almonds. I’m not sure whether this is a treat or a challenge, but either way, we had to stick to one of the regular crepes. Above: Watching our crepe being made in the little kitchen. 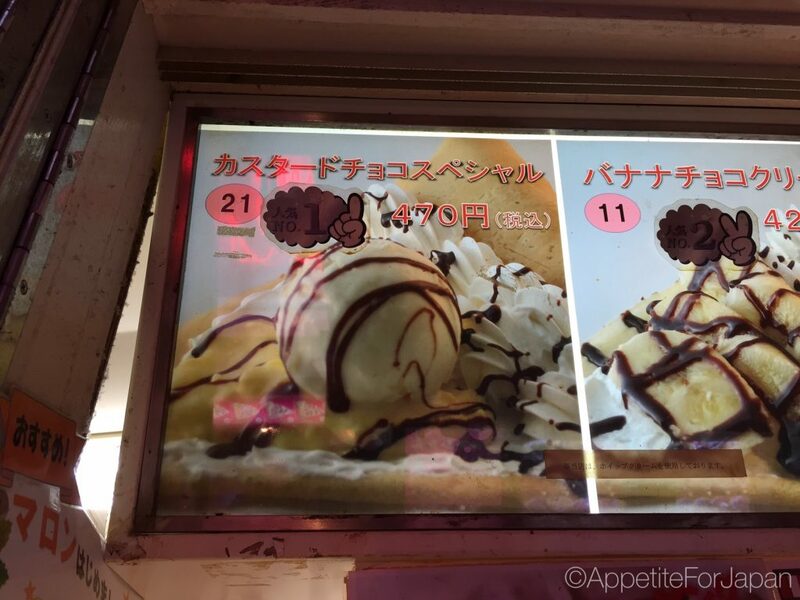 We chose #21, the custard chocolate special, which was ranked their most popular crepe at the time 470 Yen. It had custard, whipped cream, a scoop of vanilla ice-cream and some chocolate sauce. Don’t let the name fool you; this is not an American crepe chain. 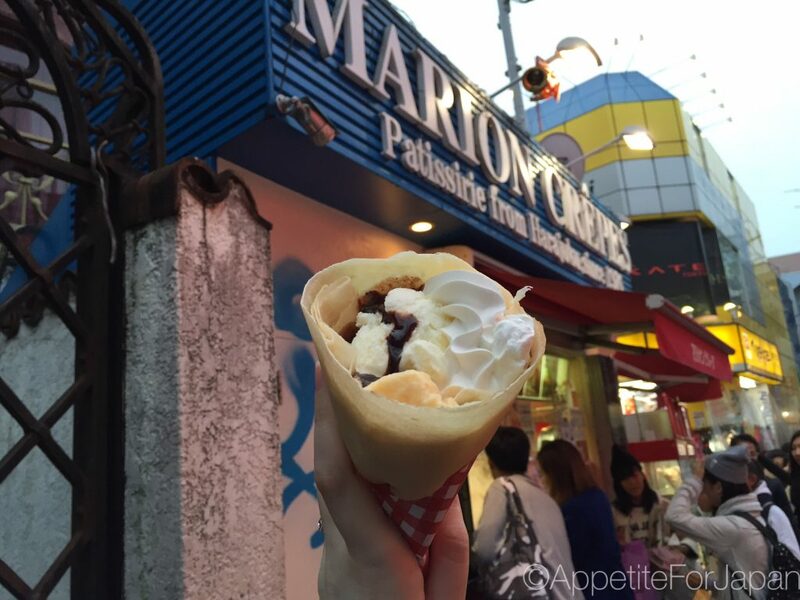 Harajuku’s Santa Monica Crepes is as Japanese as the other crepe shops in the area. Above: This branch of Santa Monica Crepes is on the corner of a building at the very end of Takeshita Dori, and has two windows to order. The main window is on the side of one of the main streets. 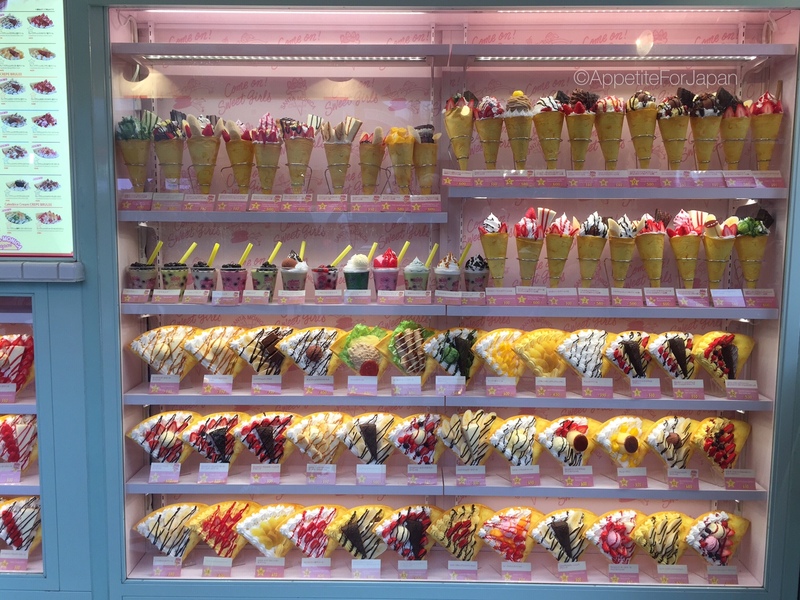 Like the other crepe places, you’ll find the fake food displays. If you look closely, you’ll see a couple of savoury crepes in there, with fillings such as tuna and lettuce. 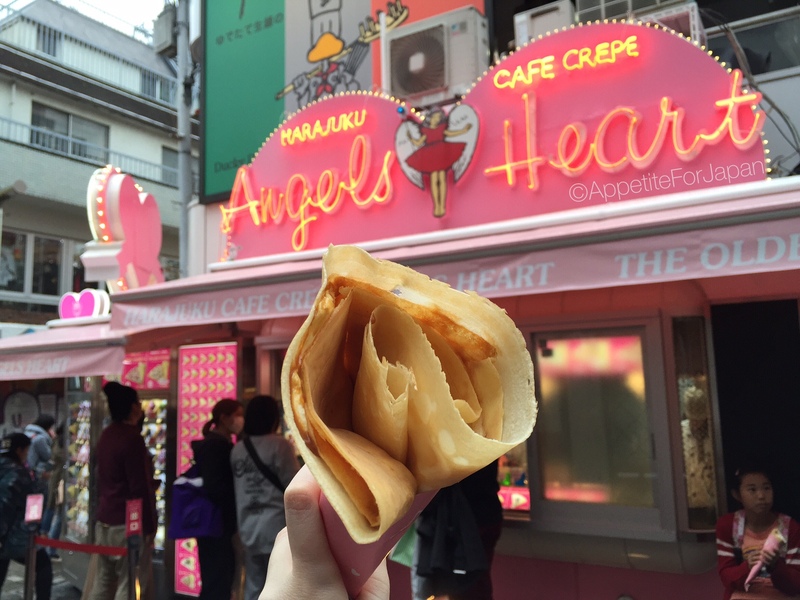 Most crepe places (including also Angel’s Heart and Marion Crepes) offer sweet and savoury crepes, although the sweet ones are the most popular. 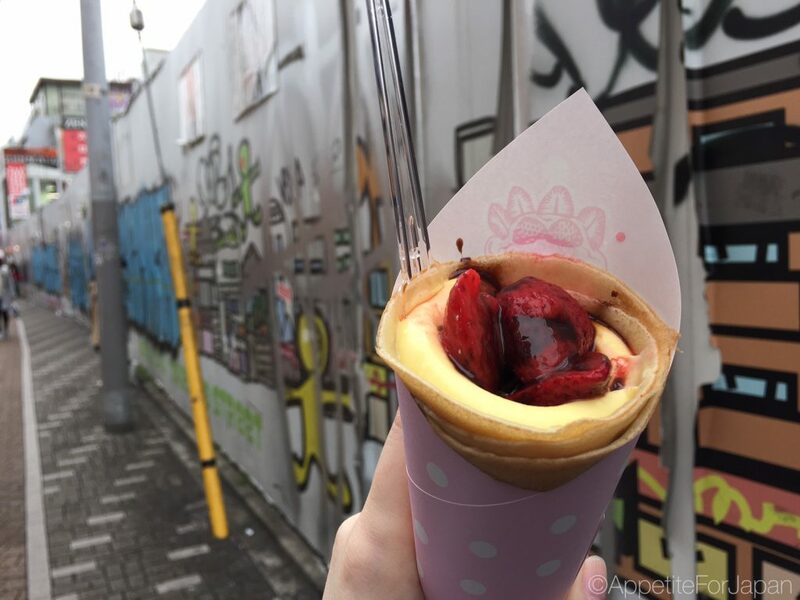 We chose #6, the custard whipped strawberry chocolate crepe – 430 Yen. Above: That’s a nicely presented crepe. 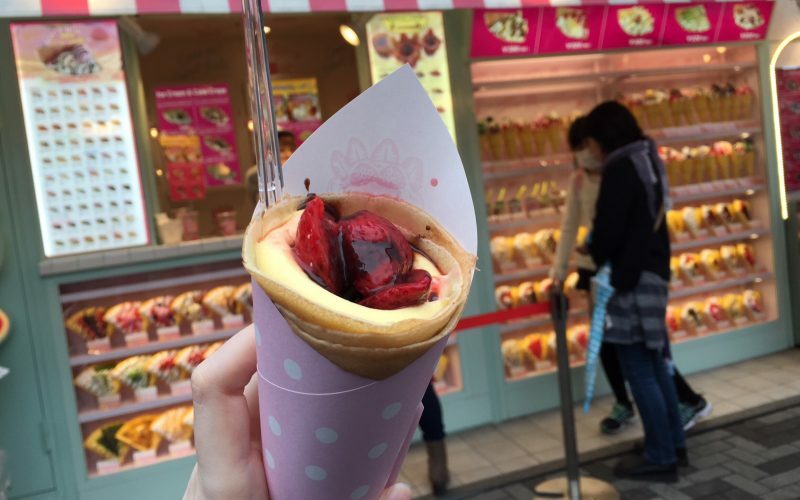 Alas, there were just four pieces of strawberry at the top, and then nothing but custard through the rest of the crepe (this is pretty common with Japanese crepes). 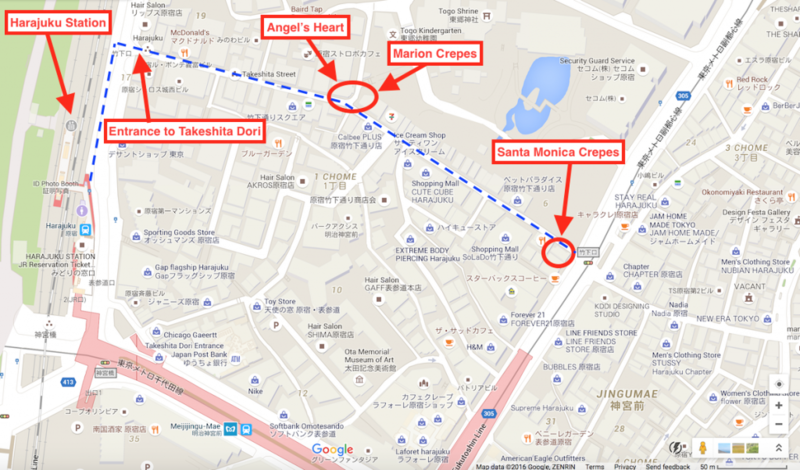 Thanks to Google Maps, here is a map that I’ve created that shows where to find Angel’s Heart, Marion Crepes and Santa Monica Crepes on Takeshita Dori, with reference to Harajuku Station. I recommend following the blue dotted line from the station, as this is the quickest and most straightforward way. 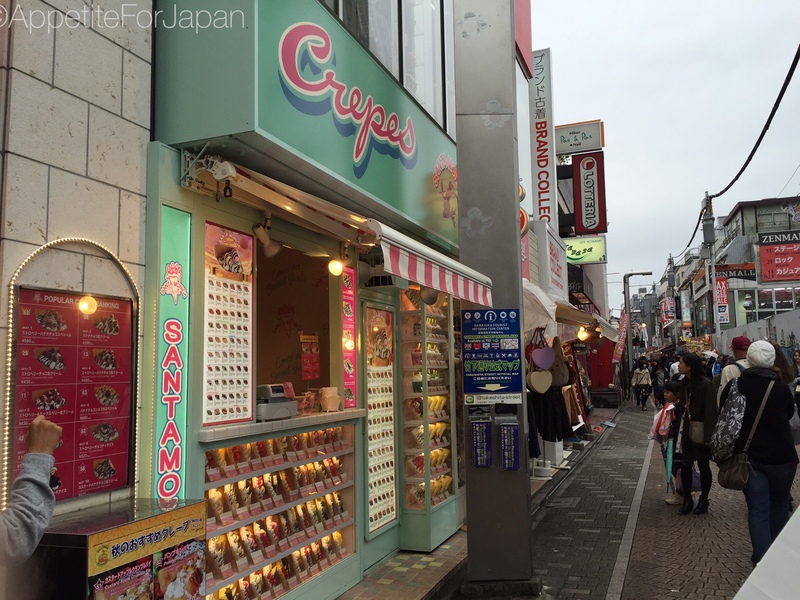 Which is the best crepe place in Harajuku? 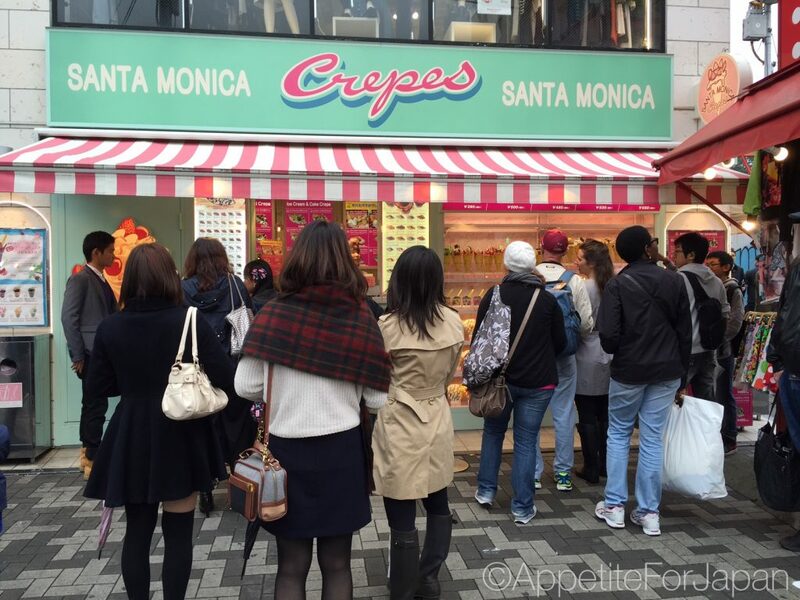 Is it Angel’s Heart of Marion Crepes – Harajuku’s two oldest crepe shops – or is it Santa Monica Crepes? 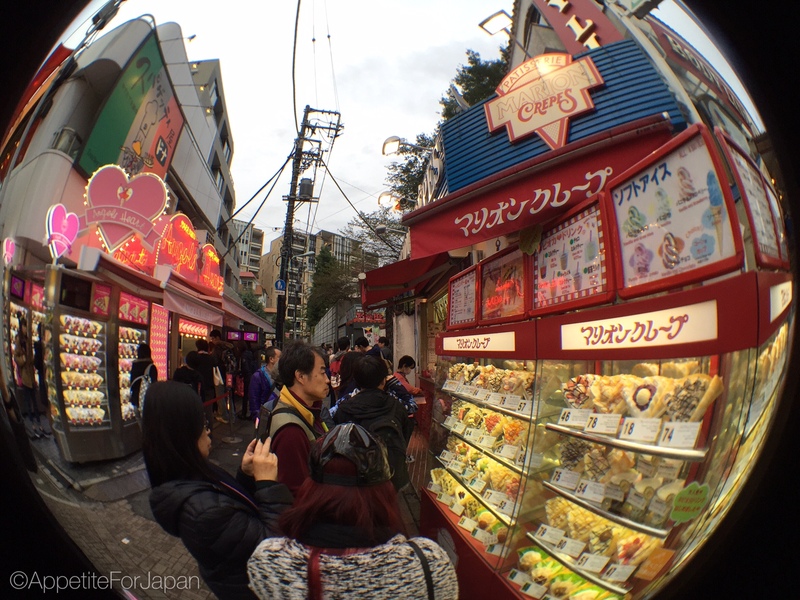 We found no significant difference in quality between the three shops. 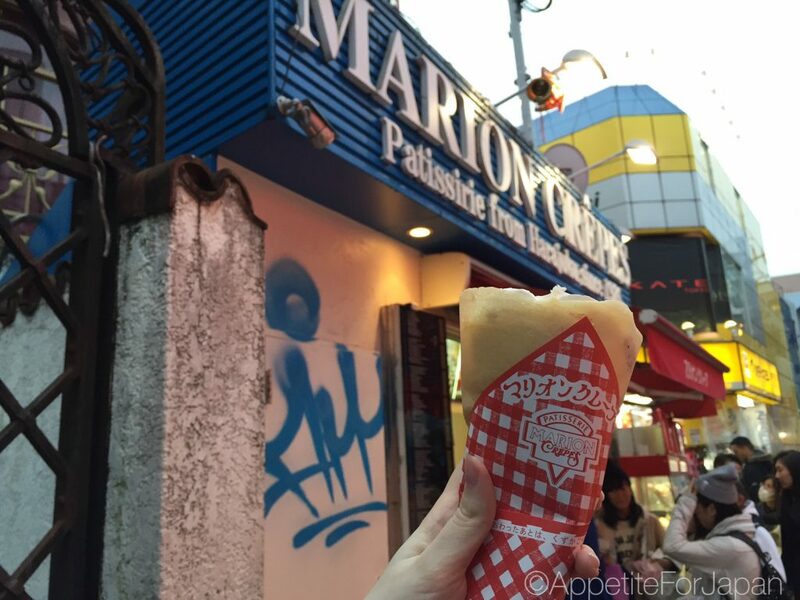 Marion Crepes had the longest line which suggests that to some people, perhaps they make the best crepes. 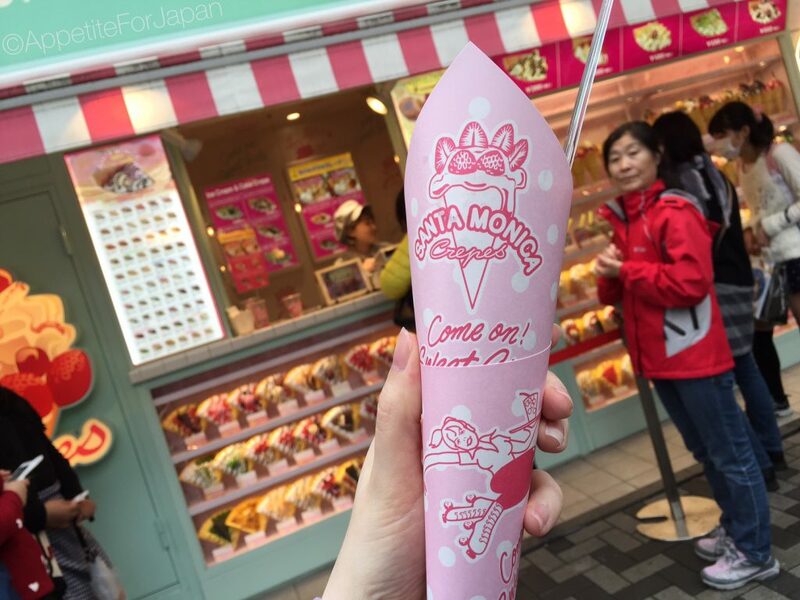 We ate a different crepe at each shop, so we weren’t comparing the exact same product (because, let’s face it, eating three crepes in quick succession is hard enough – we simply couldn’t bring ourselves to eat the same thing three times!). Ultimately, my verdict is that they are so similar in quality – despite the different fillings – that it doesn’t matter which one you choose – just pick the crepe that you like the sound of and enjoy it. 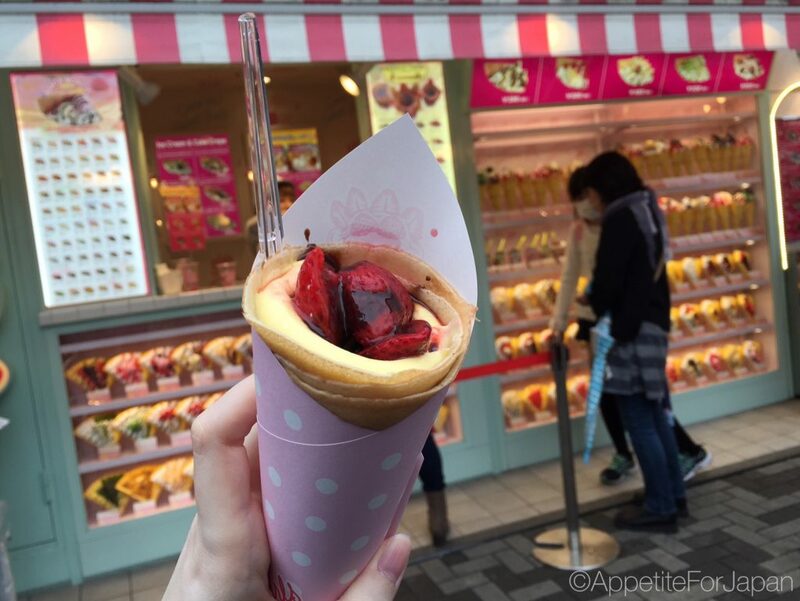 You can’t go wrong with any of these three crepe shops.